No design strategy can take the place of a friendly face behind the front desk. Make sure you have the right receptionist— someone who will greet people cheerfully, convey warmth, and open the door for clients who need a hand. A fresh coat of paint is an inexpensive, easy fix for your reception area. Lighter shades make the room seem brighter and more spacious, plus they show dirt, signaling when quick spot cleans are necessary, Longo says. If you’re designing from scratch, consider cathedral ceilings in your reception area and lots of glass on your facade, say Crosby and Longo. The airy feeling and natural light from windows create a pleasant environment. 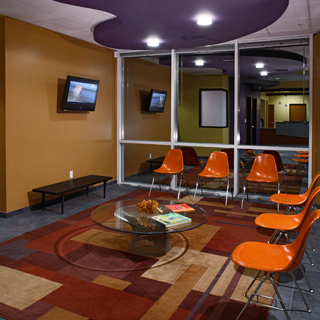 Even existing facilities can benefit from removing part of a wall to open up the space. Cats, on the other hand—along with their owners—feel more secure in smaller, more enclosed spaces away from dogs. If you can, create a separate seating area with lower ceilings for cat owners, Crosby says. Keep the space free of nooks and crannies where feline escapees can hide if they bolt from their carriers. A hard, durable floor makes the most sense for obvious reasons, but that doesn’t mean you’re limited to industrial vinyl. 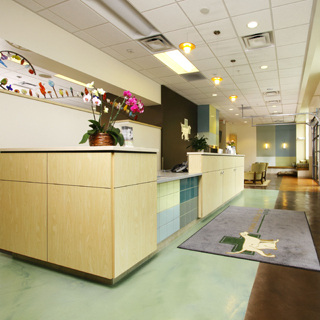 Longo and Crosby encourage their clients to consider ceramic tile for the reception area. It’s a bit pricier, but it’s warmer and more homey—and still easy to clean. Another idea, especially important in the South, is to add ceiling fans, which stir the air and add nice visual detail overhead. Plants create a front porch atmosphere, which you can enhance by using durable outdoor furniture for your seating, Longo says. Just remember to choose nontoxic greenery in case some curious pet attempts a nibble. In addition, landscaping around the entrance provides a buffer between parking lot an d hospital, shades the building in hot southern climates, and offers Buster a chance to take care of business before stepping inside. 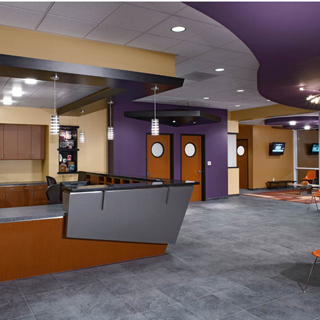 Even if you do nothing else, your reception area can get a tremendous boost from new paint, surfaces, and lighting, Longo says. Small details, such as a hook at the checkout desk where clients can tie up their pets while they’re writing checks, also make people feel valued. 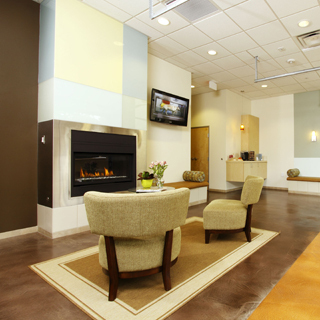 If you create a homey, peaceful atmosphere in your reception area, your clients will experience that warm sunny feeling all year long.